The JOIDES Resolution is like some sort of elite dream-team, brought together with a single purpose: plundering the watery grave of time. But unlike in Hollywood, which might have a team of safe-crackers, con-men, and explosives experts, our team has sedimentologists, geochemists, and explosives experts. Palaeontologists (or palaeos) study the remains of living things, and they’re a vital part of the science party. And unlike most of the scientists, they don’t even need a nice intact core to do their job. They’re not too fussy about layers or orientation or anything like that, they just take their sample from the messy stuff in the core catcher, which is the part at the bottom of the core barrel that stops the sediment falling back out. That little bowl of mud is (depending what we’re looking for) washed, sieved, sorted, dried, and examined. Our palaeos spend a lot of time searching for different species through microscopes. With so many tiny fossils and particles in our sediment, this is a a bit like a tiny, professional game of Where’s Wally. Planktonic foraminifera (or forams) are tiny single celled creatures which float around in the ocean. They form a hard shell called a “test” out of calcium carbonate (that’s the same material as a seashell, or chalk). When they die, their remains fall to the ocean floor, where the tests can be perfectly preserved for millions of years. 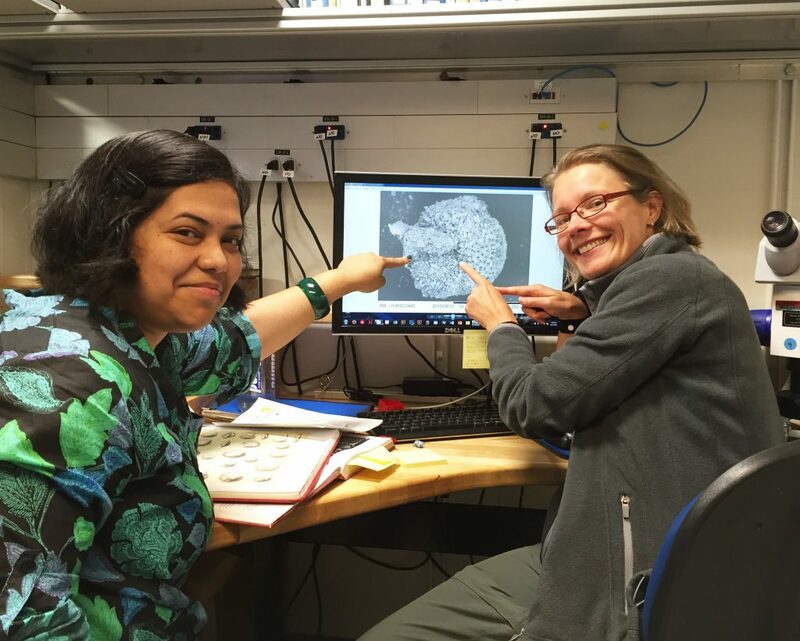 Planktonic forams are incredibly common, and evolve quite quickly, so by identifying the species in a sediment sample, and comparing it to our fossil records, we can figure out how old that piece of sediment is. Does the sediment contain a species which went extinct 6 million years ago? then the sediment must be at least 6 million years old! Benthic foraminifera are forams that live on or in the seabed, instead of floating around. Their numbers are not greatly affected by the depth of water, but planktonics are (since they have more room to float around in deeper water). So by comparing numbers of benthics and planktonics, we can get an idea of the depth and location of our ancient site. Benthic and planktonic forams can also tell us what the climate was like when they were alive; concentrations in their tests of chemicals like magnesium, or isotopes of oxygen, give us information about temperature, salinity, and ice levels. Nannofossils (or nannos) are the remains of even tinier organisms than forams. These are mostly phytoplankton, which get their energy from sunlight, so they live in the sunlit upper water column. Coastal waters are often cloudier with particles, so phytoplankton often only live in the top 100m, whereas in deeper oceans they can get down to 200m. Like forams, different species of nanno lived at different times through history, so they can help us work out how old a sediment sample is. Palaeontologists are a vital part of the team, since they can get so much information from the fossils in just a single tiny sample. And when they share that information with our other research teams, we can discover even more! So what mysterious arts do those other research teams use? Stay tuned!